Our 32 small business owning investment partners are familiar with this slide. 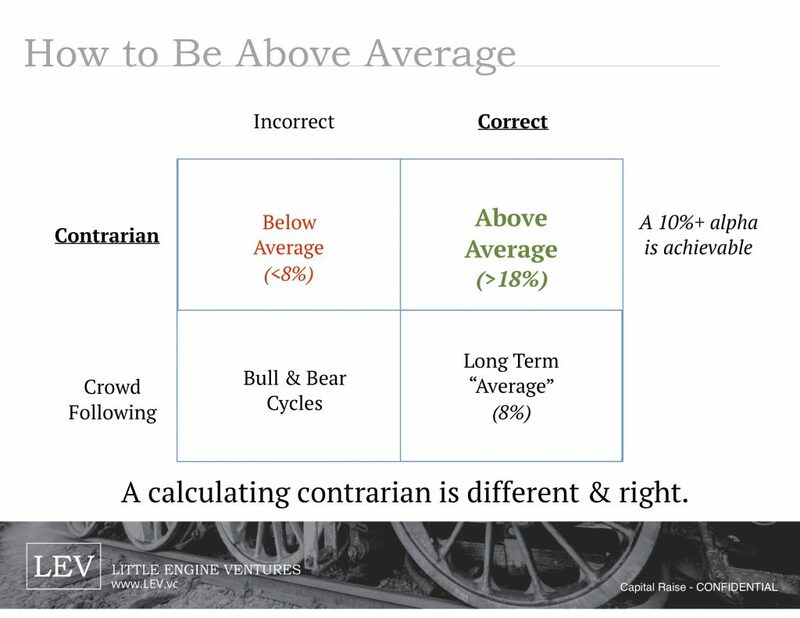 This slide is in the deck we use when describing the Little Engine Ventures partnership. It explains how Daryl and I try to think about business investment opportunities. We also find it is how our small business owning partners have made decisions in the past even if it isn’t the language they would use. You can be right. You can be different. But when you find the rare combo of being different and right you’ve found something to go hard after. I was listening to a podcast last week and came across another two word combo that I think also describes what we’re looking for at LEV. Who said it or even what podcast it was on didn’t stick with me. It was probably someone on Invest like the Best but I couldn’t find it. But looking to invest in the boring and crazy has stuck around in my head . I met a few new people this week. The question of “What do you do?” or “Who are you with?” is always one I have fun answering. If I answer it a certain way in a certain context, I get a lot of bored looks. Dumpsters. Seed Corn. If I answer it another way or in another context, I get a lot of crazy looks. Control of 9 entities in 2.5 years. Everything from auto glass to beer. If we pursue this strategy in this business, can we be right? If we work with this person, are we being different? Is this industry considered kind of boring by most? Is the combination of the above kind of crazy? Get four yes answers and we’re a go! This entry was posted in Guiding Principles, Investors. Bookmark the permalink.